For the past three years, I have been actively engaged in raising money to help conquer Multiple Sclerosis. 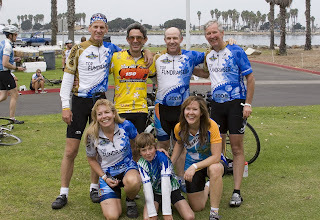 Over the past few years, I have participated in the Southern California MS150—a 150 mile bike ride down the Pacific Coast. I have raised close to $7000 in the past. On October 11-12, I will be riding in my third event. This year, I am trying to surpass what I raised last year. My goal is to raise $4,500. This event is an important. The money raised from this event will fund continuing research to discover the cause and cure for multiple sclerosis. Equally important, it will help pay for a multitude of support services, critical to those whose lives has been touched by MS.
I’d like your help in making a difference in the lives of the people and families dealing with MS. Would you please make a contribution. Clicking on the link below, takes you to the website where you can make a donation. Even better, find a local MS event and participate yourself—a walk, run, bike ride. Put together a team and start raising money to fight this disease. Thanks to all of you for reading this. Special thanks to those who help by contributing or by participating in their own local events. Thinking Of Others, Water Changes Everything! Each Of Us Can Make A Difference!